Flip Flops are a cute make and take!! Easy to make and fun to wear. Perfect for a Hawaiian, Summer or Beach themed party. This is a fun project for older toddlers with adult supervision or children. Use the theme of your party to find colored decorations to match. Rhinestones, glitter, buttons, feathers, ribbon, silk flowers, or lace to decorate. Pre-made packs of decorations at Hobby Lobby called Flip Flop Fun with themes like Smiley Faces, Ladybugs, Flowers, etc. Beacon Flip Flop Glue or Glue Gun with adult supervision. Small paper plate and popsicle or craft stick for applying glue. We used a skewer but we recommend a craft stick for safety reasons. Select your slipper size and color. Have each child select their decorations. Small containers are helpful to keep them all together. 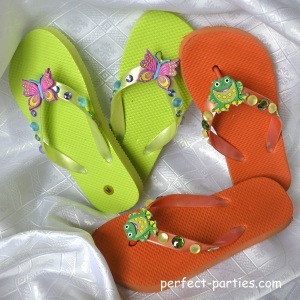 Glue decorations on with Beacon Flip Flop Glue or hot glue gun with adult supervision. You can put glue onto paper plates and use popsicle sticks to add glue to decorations. Let dry to make sure decorations hold. Place in gift bag or ziplock and write names on bags. Putting glue on small paper plates and using popsicle sticks allow for more children to work on the project at the same time. Have children plan their decorations by laying out their design. Discuss if they want to have both slippers with the same pattern. For younger children please monitor small items like rhinestones. Larger decorations like silk flowers may be more appropriate unless you have one on one supervision. Select decorations according to theme. Use the party colors or theme to match. Test how well items adhere. The shiny plastic straps will need a stronger bond. We tried Fabri-Tac but a couple of the slick rubber items didn't hold well after a week. I'd suggest using the Flip Flop Glue for best results! We'll test it next.